Getting ready to walk down the isle at your own wedding has a feeling to it – it’s unexplainable and different for everyone, but without a doubt, it is present. 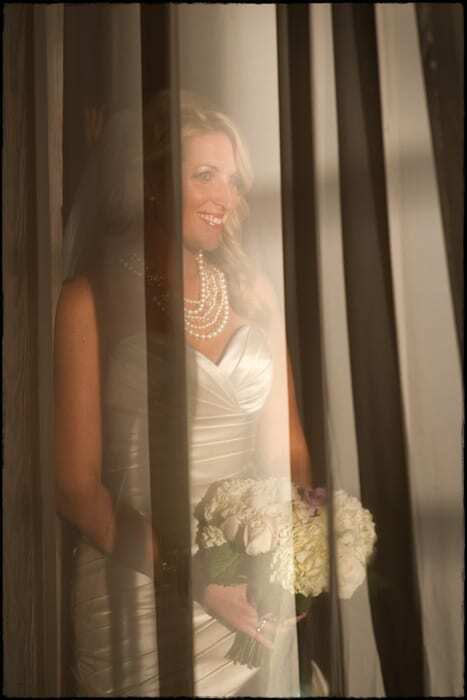 During Veritas winery wedding ceremonies, the bride is often upstairs while getting ready and then makes her way downstairs, preparing to make her entrance. Today’s image captures one of those moments. I often write about light, layering, and the feeling behind touching expressions. They all play such an important role in what we do and this provides us with no exceptions. Gina was doing her best to stay out of site so her groom, Ivey, wouldn’t see her before the processional, a tradition held to by many soon to be married couples. It was at that time that I noticed the soft, early-evening light falling on her face and her dress. It made for such a wonderful capture and shows everything you could ask for including that excited smile a bride possesses.